Drinking roulette games are created for fun. These games are usually played at home in a jolly crowd of drinking companions. Russian roulette is a fun roulette game based on the traditional deadly gun-and-bullet version, but in this version the gun and the bullet are gone. They are replaced by a plate with six vodka glasses on it. The gun is represented by the plate itself and the bullet is one of the glasses which is filled with vodka (or any other drink to fit any taste). Other glasses may be filled with water (which is again optional) and represent the gun's chambers. 'The bullet' may also be an empty glass while other ones may be filled with vodka (or another strong drink). In some variations of the game the bullet may be the glass with a drink while other ones may be filled with some disgusting liquids. The number of players may be two and more. All players are supposed to be 18 (in some countries 21) years old. Players may either choose their own plates ('guns') or play in a group and take shots in turn. Each player chooses a chamber and then tries different glasses in a clockwise manner. If there is water in the glass, the player says "Click" and puts the empty glass on the plate. Take a look on holymolycasinos.com/casino/trada-casino-review. If the glass is filled with vodka, the player says "Bang" reproducing the sound of the shooting gun. The game continues until the players are unable to consume more alcohol and everybody drops out except one. Another variant of drinking roulette is the Spin n Shot game. This game is based on the traditional roulette casino game model with a wheel and a ball. Instead of the pockets on the wheel there are 16 red and black color glasses with numbers on them. The rules of the game are very simple: the players take turns in spinning the wheel, launching the ball and drinking from the numbered glasses the ball points to. The emptied glasses must be refilled. As each glass has 2 or 3 different numbers on it, the game can continue for a very long time. As with the Russian roulette, the game continues until all of the players but one drop out. 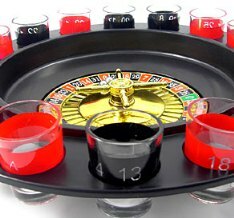 What is notable about drinking roulette games is that there are no winners or losers in the game. These games are made primarily for fun and entertainment of every player. But it is important to remember that both kinds of drinking roulette are concerned with excessive drinking which may cause serious harm to your health. That is why it is strongly recommended to be responsible and careful while playing drinking roulette games.